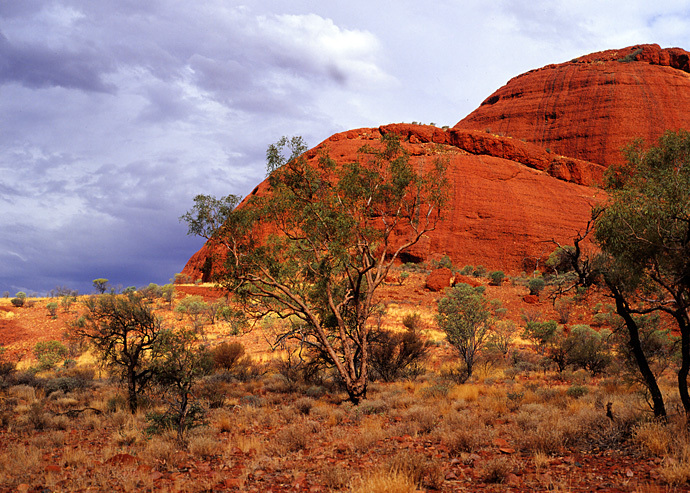 We recently visited the Uluru-Kata Tjuta National Park, and were just amazed by the breathtaking scenery. On a side note, I’d like to thank my friend Haje at photocritic for the great interview, its a great source of information for all levels of enthusiasts. And thanks to everyone who has visited. This entry (permalink) was posted on Monday, November 3rd, 2008 at 10:56 PM by John Cassimatis and categorized in Mamiya M645j. I would have way too much fun out there. Climbing on stuff and photography, who needs anything more? Nice shot, and nice web too. great shot ! i in fact looked you up to compliment you on your recent kitco article!! Toronto Wedding Photographer – Vibrant and Classy Wedding Photography in Toronto, GTA and Southern Ontario. Great colors!!! Especially because of the dark clouds in the background… What a contrast!!! LOVED reading the interview with you. Really great advice. I enjoy your pictures.